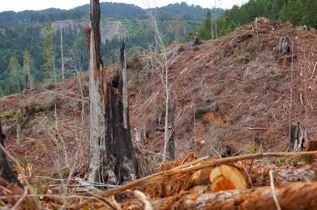 THPBlog: Green Diamond Resource Company to clearcut log trees up to 50” dbh NE of Trinidad, CA. Green Diamond Resource Company to clearcut log trees up to 50” dbh NE of Trinidad, CA. This THP is about 3.5 miles NE of Trinidad, CA and Highway 101 at an elevation of 200 to 1,240 feet. Green Diamond Resource Company is planning a mostly clearcut tractor and cable logging operation on steep and unstable slopes in Douglas fir, redwood and western hemlock forests (units E, F, G, H and I have trees up to 48” dbh). There are 12 landslide terrain sites; including unstable areas inside units C, D, I and G, and a road related fill slope failure off the BL 2220 Road. Ten osprey nests are located within .25 miles of haul roads; including an historic osprey nest within .25 miles of the LP Mill Road, an historic osprey nest within .25 miles of the BL1000 Road, and historic osprey nests within .25 miles of units C, D, H and I. Marbled murrelet habitat is located 2.1 miles east of unit F, and marbled murrelet habitat exists in Humboldt Redwoods State Park lands within .25 miles of the LP Mill Road. Southern torrent salamanders are known to occur within .5 miles of units B, C, D and G. A sharp shinned hawk was reported .4 miles east of unit A, coastal tailed frogs are known to occur within .5 miles of units A, B and G, and there is a great blue heron rockery within .25 miles of the BL2000 Road. There are spotted owl nesting territories within .25 miles of units C, D, E, H and I, and within .5 miles of units B and F.
They the green diamond holding company cut white oak groves and plant redwood as if they can grow every where. Who is holding the bank notes on this land next the park.